What do Strutt & Parker do? Strutt & Parker’s estate agents and property consultants work in partnership with clients to deliver their goals – whether their interests are in residential, commercial, rural or development property. What did Strutt & Parker need? The consultants continually researched local and national details to support their property sales. The research data was the basis of a standard report, but the new branding included a system of data icons to highlight set details, related information and specific market data. 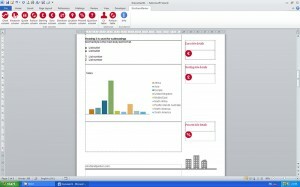 The client needed a new report template that could incorporate these icons for the team to use. The design used an unconventional page layout for Word that required the icons and their related text to sit to the right of the main column of content. The designer’s intention was to supply a folder of graphic icons that the user imported each time, but that presented a few issues. Firstly, where would the users store the icons folder? Secondly, if they were importing them each time, how successfully would the user stay within the recommended design? We proposed a number of ways to solve these issues, including the one the designer chose to implement. A custom menu offers a range of extra functionality for the user. 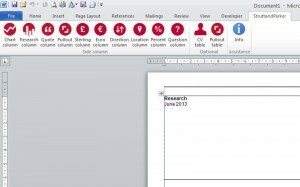 The multiple side columns are fully-automated and easy to use. 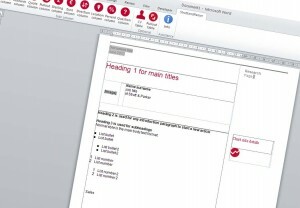 The report template followed the standard report structure of Cover, table of contents and main body pages. The cover included an optional picture, and the table of contents automatically updated based on the type styles used throughout the main body. We programmed and embedded the icons into a custom menu, which appeared whenever the user opened the research documents. Clicking an icon displays a confirmation message, and then adds the side column to the page. Each icon represents the icon inserted. This solution involves a number of programming technologies, but is a great way to manage user options, especially for problems just like this one.